Syria and its ally Russia deny responsibility for the attack, with Russia claiming that it was “staged”. Russia and Syria had cited “pending security issues to be worked out” while inspectors from the Organisation for the Prohibition of Chemical Weapons were denied access to the site of the alleged attack, said Ahmet Uzumcu, the director general of the OPCW. US Ambassador Kenneth Ward said at an OPCW meeting at the Hague on Monday that there were fears Russian forces had tampered with the site during the delay, Reuters reported. In a separate incident on Tuesday, Syrian state media briefly reported that the country’s air defences had responded to a missile attack over the western city of Homs. The US and Israel both denied carrying out any strikes, and later reports suggested the country’s air defence system may have been triggered by mistake. What is said to have happened in Douma? 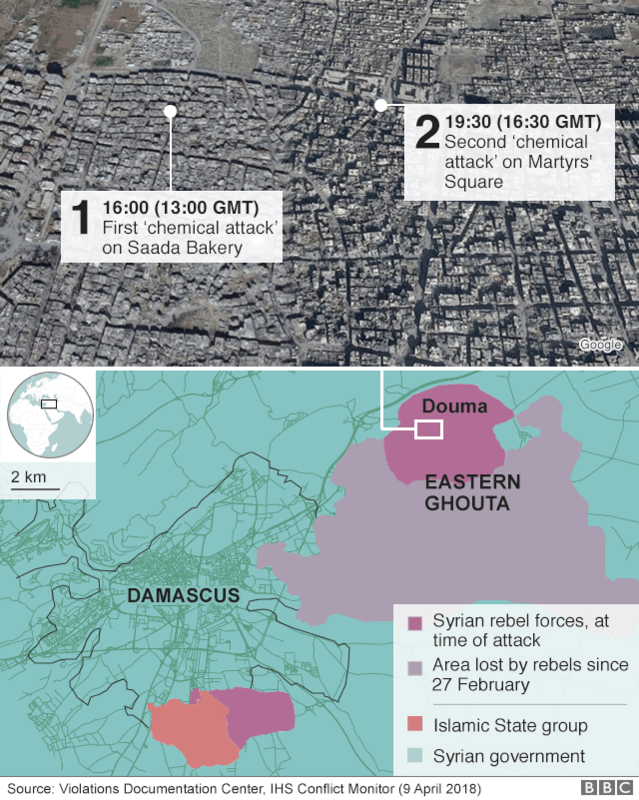 When the alleged chemical attack took place on 7 April, Douma, in the Eastern Ghouta region, was a final rebel stronghold near the capital Damascus – a suburban city battered by weeks of intense bombardment. Two bombs filled with chemicals were reportedly dropped several hours apart on the town, targeting civilians hiding underground from regular bombs. Gas, heavier than air, seeps down into basements. Syrian medical sources say men, women and children were found foaming at the mouth, with discoloured skin and cornea burns. US sources said they had obtained blood and urine samples from victims which had tested positive for chlorine and a nerve agent. Reality Check: Does Russia always use a veto on Syria? 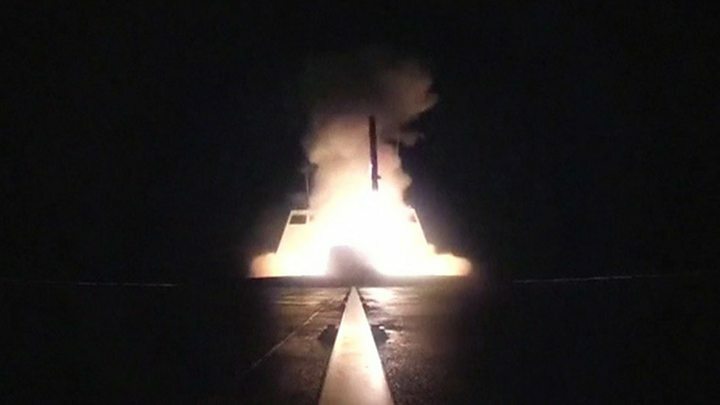 Late on Friday night in Washington, President Donald Trump announced that he had authorised strikes against Syrian military targets, in coordination with the UK and France. US forces said 105 missiles were launched, and claimed the strikes had set back Syria’s chemical weapons programme by years. 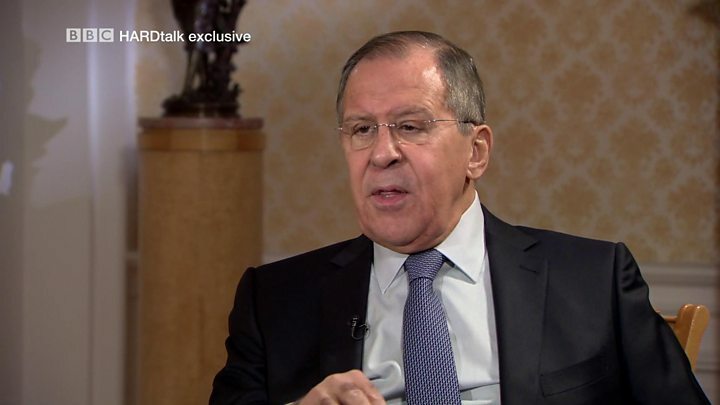 Russia said 71 of the missiles were shot down by Syrian air defence systems.